In honor of my love of both journalism and the greatest food on earth, I've set out on a quest to find restaurants who are using bacon in interesting ways. From a butcher shop smoking their own pork belly, to sweet and salty bacon caramels, I don't blame you if your mouth is already watering! But don't worry! You won't have to wait long. Look for summaries of my visits along with photos and videos incorporated in the Fall Food & Fun section on September 17th. It'll be online at OakPark.com, ForestParkReview.com, and RBLandmark.com, as well as in print in Wednesday Journal, Forest Park Review and Riverside Brookfield Landmark. Look for a 'How well do you know bacon?' quiz, an interactive map marking the stops on my journey, Bacon Bits (interesting facts you might not have known), exclusive video interviews with chefs, and more! Alicia, who has lived in Oak Park for over half her life, has long been an amateur "foodie" and a serious aficionado of all things bacon. 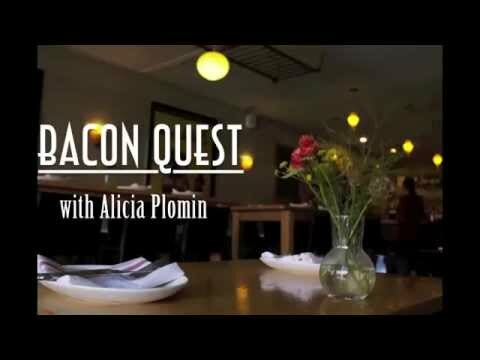 Her background in journalism and her passion for bacon was the inspiration for Bacon Quest. When she is not supporting the Sales Team at the Wednesday Journal, you'll find her at a local area restaurant seeking out unique food creations made with bacon or perhaps hosting her annual Bacon Extravaganza. Alicia lives and in Oak Park with her family. Follow me on Twitter @aplomin #BaconQuest, or on Instagram @baconlover2 to see where this Bacon Quest takes me!